BOSTON (AP) - The skyline of Boston shrinks away and before long is replaced by the blue-green orb that is planet Earth. As Earth itself moves into the rearview mirror, the moon appears, gray and foreboding, but it, too, quickly recedes into a tiny pinpoint of light. Soon visitors to the newly-renovated Charles Hayden Planetarium are leaving the solar system on their virtual spaceship, traveling at faster-than-light speeds in search of other planets in the Milky Way. And they are doing it, of course, without ever leaving their seats. The 52-year-old planetarium at Boston's Museum of Science has staked its future on the success of a $9 million facelift the museum hopes will instill in a new generation a sense of awe for the beauty of the cosmos and the mysteries it holds. After being closed for more than a year for renovations, the planetarium has been retrofitted with sophisticated new gadgetry and reopens to the public on Sunday with the world premiere of "Undiscovered Worlds: The Search Beyond Our Sun." Dubbed the most technologically advanced digital theater in New England, the planetarium uses a powerful new star projector - called the Zeiss Starmaster - to display on the planetarium's 57-foot domed ceiling more than 9,000 celestial objects - from bright nearby stars to distant, murky galaxies - all so realistic one might forget it's not the heavens on a crystal clear night. "You can actually bring binoculars in here, look at those same objects and they look just like they do in the real sky," boasts Daryl Davis, the planetarium's systems coordinator and the man who runs the starmaster, one of only two in the United States. The fiber optics video projection and animation system not only creates the illusion of traveling through space, but through time, as well. "We were always stuck on Earth. We could never travel around the universe," said David Rabkin, director of current science and technology at the museum, in describing the difference between the souped-up planetarium and the more static one of the past. The planetarium has averaged about 185,000 annual visitors in recent years, down from the 260,000 it averaged from the mid-1990s to 2003, according to the museum. 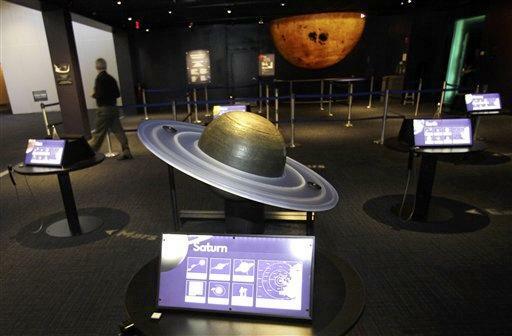 The planetarium's aging technology was cited as one factor in the drop, along with competition from other ticketed venues at the museum and fewer school field trips. The museum projects an increase to about 235,000 planetarium visitors next year. The first new show was created with the guidance of Alan Lightman, a Massachusetts Institute of Technology physicist and author of the best-selling 1992 novel "Einstein's Dreams." Lightman said in an interview that he tried to present complex and rapidly-changing science in a way that could be understood by the average person. "Science is not like the Ten Commandments. It's not handed down from thousands of years ago, it's happening right now," Lightman said. And nothing in astronomy is happening at a faster clip than the search for "exoplanets," worlds that exist outside our own solar system. Too small and too dim to be spotted by conventional telescopes, exoplanets can only be discovered through painstaking scientific detective work. Astronomers look for the slight "wobble" of a star caused by a planet's gravitational tug, or for a "light curve" that occurs when a planet's orbit passes in front of its star. NASA announced earlier this month that its orbiting Kepler telescope had found 1,235 possible planets outside the solar system. That represented a huge jump from the approximate 500 exoplanets discovered since the first one was spotted just 15 years ago. "Undiscovered Worlds" uses animation to simulate for viewers how some of these alien worlds might appear. One planet, dubbed Corot 7b, orbits its star in the equivalent of 20 Earth hours and likely has a surface of molten lava, and others are inhospitable gas giants, comparable to Neptune in our own solar neighborhood. But at least a handful are believed to be Earth-like planets in temperate zones neither too close nor too far from their stars, raising the tantalizing possibility that they host life - perhaps even intelligent life. Museum of Science officials are hopeful that the rejuvenated planetarium will excite a new generation of visitors and encourage parents nostalgic about their own childhood visits to the facility to return with their own children, or grandchildren. Among those who contributed to the fundraising campaign for the planetarium was New York Mayor Michael Bloomberg. A regular visitor to the museum as a child growing up in nearby Medford, Mass., Bloomberg was among the guests at a VIP showing of the new exhibit on Thursday. "He was really influenced by this museum and he has a great love for it," Rabkin said.